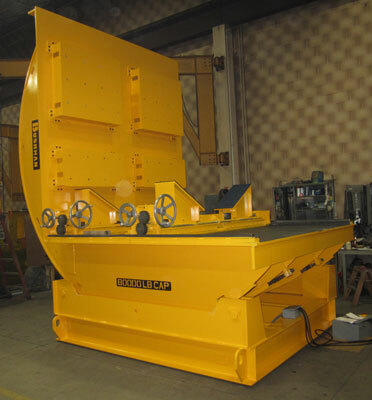 Bushman Equipment, Inc, a manufacturer of custom-engineered material handling solutions, recently delivered a mechanical upender specially equipped with manually adjustable, hand crank V-blocks to a manufacturer that serves the nuclear power industry. The primary use for the floor-based unit is to upend to 90 degrees, large cylindrical weldments weighing up to 80,000 pounds. Bushman engineers designed the upender platforms to accommodate as many as six different-shaped pieces. The engineering challenge was to provide easily adjustable V-blocks that could accommodate different diameters and lengths of product for upending. The customer had previously used rigging, cranes, and different material handling procedures requiring nearly one full day to upend a work piece. Now, with the Bushman® upender, the same task will be performed safely and efficiently in 15 minutes.